Using 28mm extension tubes from Comar Instruments, Cambridge, a 25mm diameter planoconvex lens with a focal length of 10mm (number) was mounted to collimate light from a 5W Royal Blue Lumiled. The Comar extension tubes are cheap and allow the direct internal mounting of standard 25mm diamter optics without the need for expensive adapters. 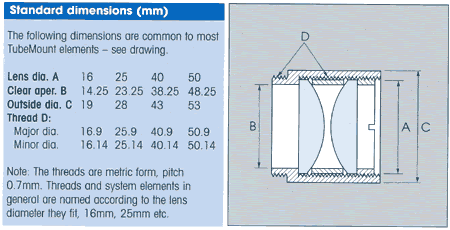 The collimated light from the LED is passed through a short pass filter, followed by a planoconvex lens with a focal length of 100mm, in order to focus the blue light at the back focal plane of the objective. A filter block for a commercial fluorescence microscope typically costs around £400-£700. 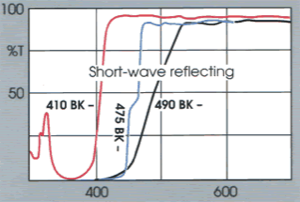 This is due to the use of expensive interference filters and dichroic beamsplitters. 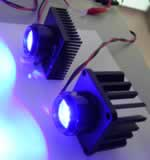 With the invaluable help of Dr. Brad Amos, MRC Laboratory of Molecular Biology, Cambridge, I have constructed a low cost alternative that is very effective for the detection of green fluorescent protein signals using blue LED illumination. Brad suggested that the beamsplitter could be made of Dichrolite, which are coated glasses produced for applications such as theatrical lighting. A variety of these glasses are available with different colours, and different dichroic properties. 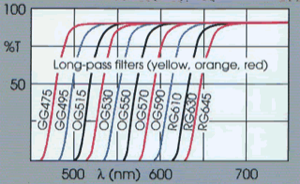 An image of a sampler of various dichrolite filters is shown below. Cheapo filter set for GFP fluorescence. 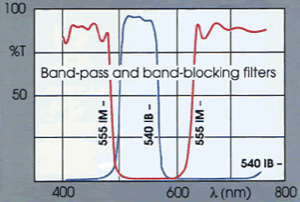 Magenta band blocking filter used as a short pass filter with a blue LED light source. Blue-reflecting mirror, mounted at 45 degrees to the light path. Yellow Schott glass filter OG515, long pass filter. With a video camera placed on the filter block, all specimen positioning and focussing is done using the video output, displayed on a monitor or computer screen. Most firewire capture software provides a preview that is adequate for this. However, for lower cost and ease of use, direct inspection of fluorescence though the microscope would be a useful option. So I have experimented with the placement of an eyepiece above the filter block in this 160mm tube length microscope, and this works although it is a clumsy arrangement for viewing. The illuminator and filter block is now being adapted as an intermediate module for a microscope with infinity corrected optics.